David Graeber and David Wengrow recently wrote a long piece in the New Humanist, Are we city dwellers or hunter-gatherers? New research suggests that the familiar story of early human society is wrong – and the consequences are profound. What follows is my critical review of it. The structure that I adopt is quoting large chunks from their essay followed by my commentary (I don’t usually quote at length, but since my take is quite critical, I chose to let the authors speak in their voices, rather than paraphrase). Graeber is an American anthropologist and anarchist activist. I read three of his books, including Debt. Wengrow is an archaeologist specializing in the early history of Egypt. I read two of his books, including What Makes Civilization? Both aim at the “public intellectuals” status, with Graeber, clearly, much farther along the way to fame. Let’s see how well their latest piece works. What it says is that once the polity population gets to roughly 200 thousand (and certainly by the time you exceed a couple of millions), it must have sophisticated government institutions, including professional bureaucrats. A society numbering in millions simply can’t function without specialized administrators. 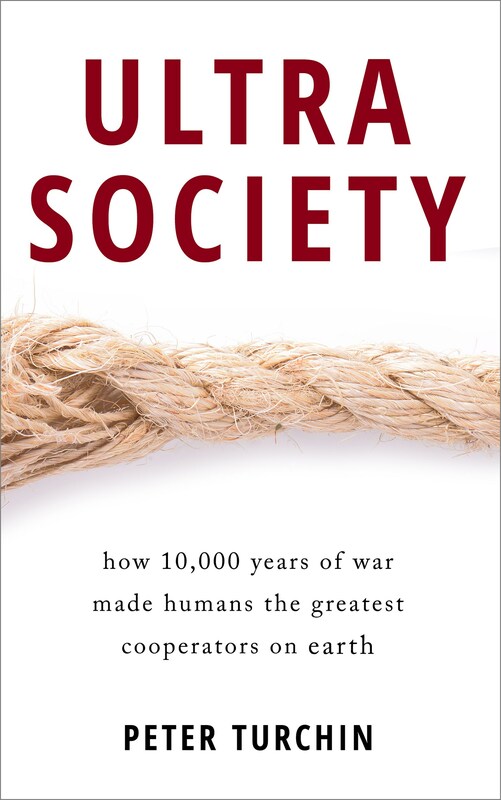 Societies that try to do it, instead fall apart, which is why we don’t see them today, or (much) in history. The conclusion from this is that the way forward to sustaining and increasing the well-being of large segments of population is not to abolish government, but to evolve institutions that keep bureaucrats working for the benefit of the population, rather than themselves. But let’s get on with the essay. There is a fundamental problem with this narrative: it isn’t true. … Those writers who are reflecting on the “big questions” of human history – Jared Diamond, Francis Fukuyama, Ian Morris and others – still take Rousseau’s question (“what is the origin of social inequality?”) as their starting point, and assume the larger story will begin with some kind of fall from primordial innocence. Graeber and Wengrow employ here an old and highly effective, but intellectually dishonest rhetorical device. They present the reader with a caricature, and then associate it with authors who actually say quite different things. Ian Morris, for example, is hardly a Rousseauian. Just read his War, What Is It Good for? Not that I necessarily agree with everything he says (see this blog post). What we’re going to do in this essay, then, is two things. First, we will spend a bit of time picking through what passes for informed opinion on such matters, to reveal how the game is played, how even the most apparently sophisticated contemporary scholars end up reproducing conventional wisdom as it stood in France or Scotland in, say, 1760. Then we will attempt to lay down the initial foundations of an entirely different narrative. This is mostly ground-clearing work. The questions we are dealing with are so enormous, and the issues so important, that it will take years of research and debate to even begin to understand the full implications. But on one thing we insist. Abandoning the story of a fall from primordial innocence does not mean abandoning dreams of human emancipation – that is, of a society where no one can turn their rights in property into a means of enslaving others, and where no one can be told their lives and needs don’t matter. On the contrary. Human history becomes a far more interesting place, containing many more hopeful moments than we’ve been led to imagine, once we learn to throw off our conceptual shackles and perceive what’s really there. Well, let’s throw off our conceptual shackles and follow the authors on their intellectual journey. I again skip quite a bunch of paragraphs, in which Graeber and Wengrow first expand on their caricature and then criticize Jared Diamond and Francis Fukuyama. A few of their criticisms I actually agree with—for my alternative view on the rise of complex societies during the last 10,000 years, see my 2016 book Ultrasociety. A dismal conclusion, not just for anarchists, but for anybody who ever wondered if there might be some viable alternative to the status quo. But the remarkable thing is that, despite the smug tone, such pronouncements are not actually based on any kind of scientific evidence. There is no reason to believe that small-scale groups are especially likely to be egalitarian, or that large ones must necessarily have kings, presidents or bureaucracies. These are just prejudices stated as facts. In the case of Fukuyama and Diamond one can, at least, note they were never trained in the relevant disciplines (the first is a political scientist, the other has a PhD on the physiology of the gall bladder). Ouch! What could a gall bladder specialist possibly tell us about the evolution of human societies?? Seriously, what does the topic of dissertation that Diamond defended in 1961 have to do with the validity of his ideas four decades later? Diamond is a broad-band thinker, who during his long career contributed to diverse fields (including, for example, community ecology). His ideas may be controversial (and I don’t agree with everything he says), but they have been influential and productive — that is, they lead to new empirical and theoretical research. Still, even when anthropologists and archaeologists try their hand at “big picture” narratives, they have an odd tendency to end up with some similarly minor variation on Rousseau. In The Creation of Inequality: How our Prehistoric Ancestors Set the Stage for Monarchy, Slavery, and Empire (Harvard University Press, 2012), Kent Flannery and Joyce Marcus, two eminently qualified scholars, lay out some 500 pages of ethnographic and archaeological case studies to try and solve the puzzle. Here the Davids actually make a good point. I myself slammed Flannery and Marcus for dragging in Rousseau in an otherwise positive review of their book in the Times Literary Supplement (unfortunately behind a paywall, but the preprint is here). After several more paragraphs, Graeber and Wengrow finally get to presenting their alternative understanding about the course of human history. So, what do we actually know about this period of human history? Much of the earliest substantial evidence for human social organisation in the Palaeolithic derives from Europe, where our species became established alongside Homo neanderthalensis, prior to the latter’s extinction around 40,000 BC. (The concentration of data in this part of the world most likely reflects a historical bias of archaeological investigation, rather than anything unusual about Europe itself.) … Prehistorians have pointed out for some decades – to little apparent effect – that the human groups inhabiting these environments had nothing in common with those blissfully simple, egalitarian bands of hunter-gatherers still routinely imagined to be our remote ancestors. Indeed, this is an amazing display of wealth. In The Upper Paleolithic of the Central Russian Plain (p. 456), Olga Soffer estimates that just the beads alone represent over 2,500 hours of human labor. But this is only a single datum to support a lot of theory. Furthermore, we don’t really know what role the children played. Were they “princes”? Or sacrifices, as some archaeologists suggested? Such findings appear to have no significant place in any of the books so far considered. Downplaying them, or reducing them to footnotes, might be more easy to forgive were Sungir an isolated find. It is not. 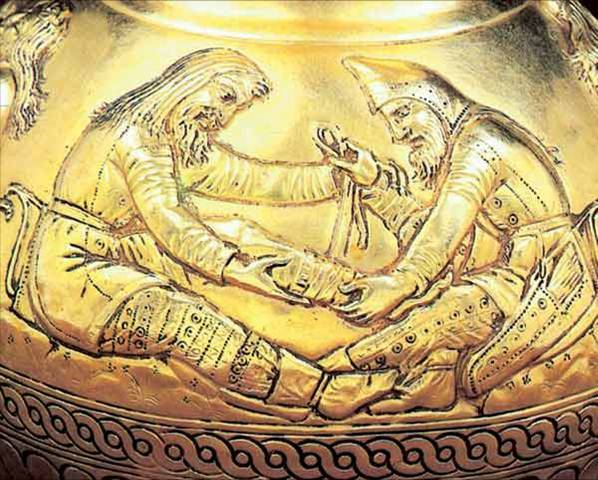 Comparably rich burials are by now attested from Upper Palaeolithic rock shelters and open-air settlements across much of western Eurasia, from the Don to the Dordogne. Among them we find, for example, the 16,000-year-old “Lady of Saint-Germain-la-Rivière”, bedecked with ornaments made of the teeth of young stags hunted 300 km away, in the Spanish Basque country; and the burials of the Ligurian coast – as ancient as Sungir – including “Il Principe”, a young man whose regalia included a sceptre of exotic flint, elk antler batons and an ornate headdress of perforated shells and deer teeth. These other examples don’t sound very compelling to me. It would be good to get a professional archaeologist estimate of the amount of human labor needed to produce these ornaments, but I doubt it would approach the Sunghir grave. Still, the point is well taken that we do see substantial displays of wealth in pre-Neolithic societies. This is not news for archaeologists, however, because pretty much everybody I talk to agrees that it’s not really agriculture that leads to the rise of inequality. Foraging societies in highly productive areas, like Northwest Indians, have developed highly unequal societies with high differentials in wealth, slavery, etc. No less intriguing is the sporadic but compelling evidence for monumental architecture, stretching back to the Last Glacial Maximum. The idea that one could measure “monumentality” in absolute terms is of course as silly as the idea of quantifying Ice Age expenditure in dollars and cents. It is a relative concept, which makes sense only within a particular scale of values and prior experiences. 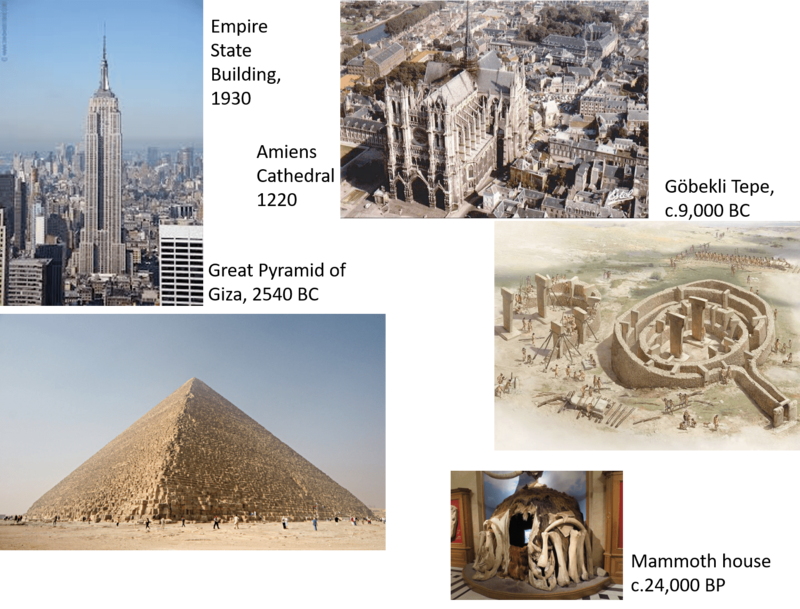 The Pleistocene has no direct equivalents in scale to the Pyramids of Giza or the Roman Colosseum. But it does have buildings that, by the standards of the time, could only have been considered public works, implying sophisticated design and the coordination of labour on an impressive scale. Among them are the startling “mammoth houses”, built of hides stretched over a frame of tusks, examples of which – dating to around 15,000 years ago – can be found along a transect of the glacial fringe reaching from modern-day Kraków all the way to Kiev. Until this paragraph I’ve been half-willing to go for a ride with Graeber/Wengrow. Yes, they caricature the views of their opponents, and are not above ad hominem attacks, but I agree with some of the points they make, such as that there was no sharp transition in human social evolution with the adoption of agriculture (and it’s worth pointing out that this is not a novel idea for most Neolithic archaeologists). With this passage, however, Graeber and Wengrow themselves become guilty of monumental silliness. First, their dismissal of the possibility of measuring monumentality. In my experience, refusal to quantify is usually the last refuge of those who don’t want to see their pet theories rejected. G&W are not above quantifying when it suits their needs. Clearly 5,000 laboriously carved and polished beads represent a much more massive investment of human labor than 5 beads. Three orders of magnitude, to be precise (an order of magnitude is a 10-fold change). This is a truly big difference. Second, archaeologists are already quantifying monumentality — by how much labor, in people-hours of work, it takes to construct the monument in question. Human labor is a universal coin. Yes, there is some variation in how much different people value an hour of work (and it depends, of course, on the kind of work). But there are ways to incorporate such factors into our estimates. An hour of construction work is a pretty good unit. What’s important, is that any variations in the value of this unit in different cultures and different periods of human evolution are dwarfed by the many orders of magnitude in the sheer number of work hours needed to construct different monuments in human history. I doubt that it took one person more than a day to construct a mammoth hut (after you have hunted down and butchered the mammoth, of course). It would take much more time (and people) to eat such a mountain of meat! The difference between one day of work and 300 people-years, required for Gobekli Tepe, is 5 orders of magnitude (365 days/year x 300 people-years = 109,500 people-days). 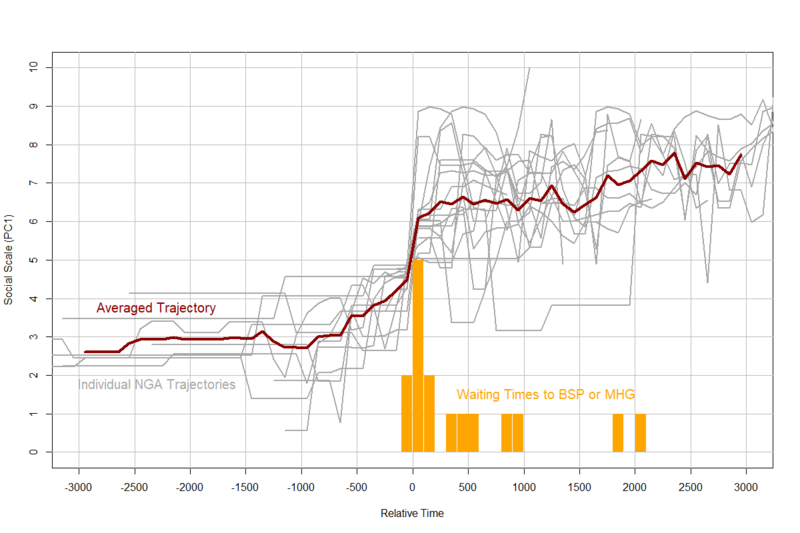 And there is another jump of 3 orders of magnitude from Gobekli to the Great Pyramid. Claiming that the monumentality of a mammoth house is not really different from that of the Great Pyramid is, well, silly. Indeed, 5 orders of magnitude more astonishing than a mammoth hut. And note that, although the builders of Gobekli Tepe did not practice agriculture, crops such as wheat and barley were already cultivated in areas only a couple hundred kilometers away. What, then, are we to make of all of this? One scholarly response has been to abandon the idea of an egalitarian Golden Age entirely, and conclude that rational self-interest and accumulation of power are the enduring forces behind human social development. But this doesn’t really work either. Evidence for institutional inequality in Ice Age societies, whether in the form of grand burials or monumental buildings, is nothing if not sporadic. Burials appear literally centuries, and often hundreds of kilometres, apart. Even if we put this down to the patchiness of the evidence, we still have to ask why the evidence is so patchy: after all, if any of these Ice Age “princes” had behaved anything like, say, Bronze Age princes, we’d also be finding fortifications, storehouses, palaces – all the usual trappings of emergent states. A wider look at the archaeological evidence suggests a key to resolving the dilemma. It lies in the seasonal rhythms of prehistoric social life. Most of the Palaeolithic sites discussed so far are associated with evidence for annual or biennial periods of aggregation, linked to the migrations of game herds – whether woolly mammoth, steppe bison, reindeer or (in the case of Göbekli Tepe) gazelle – as well as cyclical fish-runs and nut harvests. At less favourable times of year, at least some of our Ice Age ancestors no doubt really did live and forage in tiny bands. But there is overwhelming evidence to show that at others they congregated en masse within the kind of “micro-cities” found at Dolní Věstonice, in the Moravian basin south of Brno, Czech Republic, feasting on a superabundance of wild resources, engaging in complex rituals and ambitious artistic enterprises, and trading minerals, marine shells and animal pelts over striking distances. Western European equivalents of these seasonal aggregation sites would be the great rock shelters of the French Périgord and Spain’s Cantabrian coast, with their famous paintings and carvings, which similarly formed part of an annual round of congregation and dispersal. Why are these seasonal variations important? Because they reveal that from the very beginning, human beings were self-consciously experimenting with different social possibilities. Anthropologists describe societies of this sort as possessing a “double morphology”. … Most striking, in terms of political reversals, were the seasonal practices of 19th-century tribal confederacies on the American Great Plains – sometime or one-time farmers who had adopted a nomadic hunting life. In the late summer, small and highly mobile bands of Cheyenne and Lakota would congregate in large settlements to make logistical preparations for the buffalo hunt. At this most sensitive time of year they appointed a police force that exercised full coercive powers, including the right to imprison, whip or fine any offender who endangered the proceedings. Yet as the anthropologist Robert Lowie observed, this “unequivocal authoritarianism” operated on a strictly seasonal and temporary basis, giving way to more “anarchic” forms of organisation once the hunting season and the collective rituals that followed were complete. Scholarship does not always advance. Sometimes it slides backwards. A hundred years ago, most anthropologists understood that those who lived mainly from wild resources were not, normally, restricted to tiny “bands”. 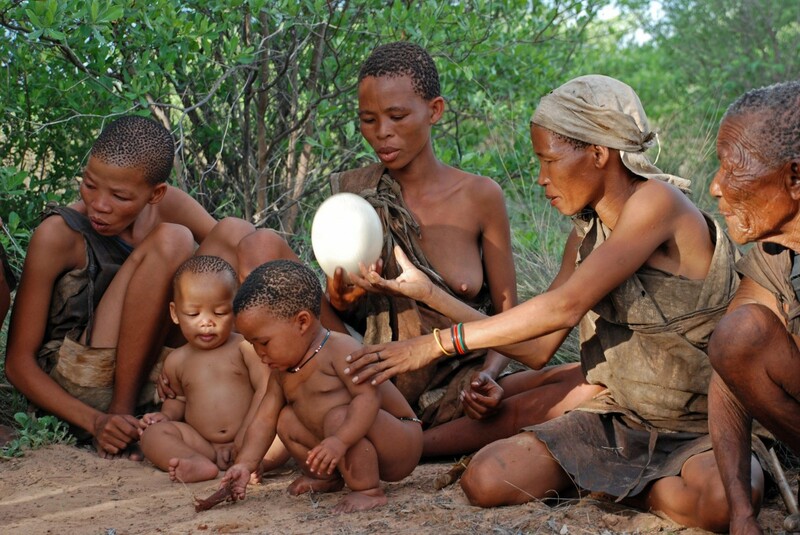 That idea is really a product of the 1960s, when Kalahari Bushmen and Mbuti Pygmies became the preferred image of primordial humanity for TV audiences and researchers alike. As a result we’ve seen a return of evolutionary stages, really not all that different from the tradition of the Scottish Enlightenment: this is what Fukuyama, for instance, is drawing on, when he writes of society evolving steadily from “bands” to “tribes” to “chiefdoms”, then finally, the kind of complex and stratified “states” we live in today – usually defined by their monopoly of “the legitimate use of coercive force”. By this logic, however, the Cheyenne or Lakota would have had to be “evolving” from bands directly to states roughly every November, and then “devolving” back again come spring. Here we go again. To equate late summer congregations of the Cheyenne or the Lakota to complex stratified states does as much violence to data as equating a mammoth hut to a great pyramid. The social scale of such seasonal congregations of hunter-gatherers was a few thousand people. Complex large-scale societies organized as states, such as we find in Ancient Egypt, have populations counted in millions, tens of millions, and more. That’s a difference of 3-4 orders of magnitude. States are also organized in a centralized fashion. There is a supreme ruler (a king, an emperor, or a president) at the top of deep vertical hierarchy with 4, 5, 6 and more levels of control. Even more importantly, states are characterized by a internally specialized governance. This means that we have people who specialize as administrators (the bureaucrats), others as military leaders (officers), yet other as ideological leaders (priests). There was nothing like that in the Cheyenne society. Of all American Indian societies on the Great Plains, it was the Comanche who approached a politically centralized society the closest, but even they did not have a supreme leader (read the great book The Comanche Empire by Pekka Hamalainen for this fascinating story). A monopoly on legitimate use of coercive force is also a huge stretch. Tribal police of the Plains Indians was a community-based force whose purpose was to control non-cooperators. In fact, small-scale societies can control the behavior of their members much more effectively (and oppressively) than the state’s police, as anybody who lived in a small village can attest. Indeed. And Graeber and Wengrow provide us with a striking example of how ideology can override common sense. …the real question is not “what are the origins of social inequality?” but, having lived so much of our history moving back and forth between different political systems, “how did we get so stuck?” All this is very far from the notion of prehistoric societies drifting blindly towards the institutional chains that bind them. It is also far from the dismal prophecies of Fukuyama, Diamond et al. where any “complex” form of social organisation necessarily means that tiny elites take charge of key resources, and begin to trample everyone else underfoot. Jared Diamond notwithstanding, there is absolutely no evidence that top-down structures of rule are the necessary consequence of large-scale organisation. Walter Scheidel notwithstanding, it is simply not true that ruling classes, once established, cannot be gotten rid of except by general catastrophe. And social movements organized on the principle of anarcho-populism invariably fail. As did the Occupy Movement in which David Graber played an important role. Where are the “occupiers” today? What have they accomplished? Nothing. The only way to achieve a lasting positive change at the society’s level is through effective political organization, which in humans means chains of command (I explain why in Ultrasociety). Of course, once leaders emerge there is a terrible temptation for them to subvert their social power to their selfish purposes. This is why the first centralized societies quickly became despotisms. But then cultural group selection started weeding out the most despotic societies, resulting in the evolution of norms and institutions that began to restrain the worse excesses of power abuse. I tell this story in Ultrasociety. The pieces are all there to create an entirely different world history. For the most part, we’re just too blinded by our prejudices to see the implications. True. Unfortunately, it is David Graeber and David Wengrow who are blinded by their ideology. If you are interested in an alternative view of social evolution, different from both Graber/Wengrow’s and their caricature of the conventional narrative, read Ultrasociety. As I explain in the book, there is a way forward to a peaceful, affluent, and just society. But anarchism is not such a way — it’s a blind alley. Yep…I’ll take ULTRASOCIETY any day. I read the whole essay by Graeber and Wengrow a while back. They are making a mountain out of a molehill (the real structure and inequality in small-scale societies–yep, it’s there, it just isn’t huge). Graeber is always deliberately provocative, which is endearing and challenging but not the road to accuracy…. At least he makes people think, and you, Peter, have been thinking to very good purpose. And of course there was inequality in small-scale societies, but how could one deny the massive increase in inequality associated with the first centralized ones, complex chiefdoms and archaic states? Thank you for the clarity and rigor you brought to this informal piece. May you prompt thoughtful reflection and we see questions that further research questions. Peter, what do you think of Elinor Ostrom’s concept of polycentric governance? In her early work she described “chaotic” systems, like water management in California, where a mixture of larger and smaller entities engaged in the business of supplying water most of them not formally subordinated to top-down hierarchical control. By her account this system was able to tailor solutions to problems in a quite efficient way. California indeed has the general concept of “special districts” in which local public agencies self-organize to provide such things as cemeteries, schools, fire protection, water, mosquito abatement and the like. These seem generally to be quite efficient at providing the goods and services in question. In her later work she seems to show that village scale communities often solve commons problems in situations where hierarchical governance systems fail. Empires like the Ottomans seem to have been largely organized to provide military protection and a few other services centrally. Religious institutions, cities, private businesses, and tribes seem to have organized most of the collective action that made the society run. In India, the cast system is sometimes said to have made the state almost unnecessary by organizing most collective action at the level of the Jati. My archaeologist colleague Robert Bettinger argues that in California hierarchical governance structures tended to whither and a sort of orderly anarchy grew up as population increased, the opposite of the trajectory towards more hierarchy on the Northwest Coast. Institutions such as money and customary law evolved instead of hierarchy. It seems to me that if there is a viable version of anarchy it would go through the concept of concepts like polycentric governance and institutionalized orderly anarchy. Ostrom, E. (2010). “Beyond markets and states: polycentric governance of complex economic systems.” American economic review 100(3): 641-672. Bettinger, R. L. (2015). Orderly Anarchy: Sociopolitical Evolution in Aboriginal California. Berkeley, University of California Press. Pete, this is a big question. If in short, clearly it depends on what kind of public goods we want to produce. Decentralized free market is the answer when there are lots of producers and consumers and no realistic possibility for a monopolist to control it all (or government regulations to prevent monopoly). Small-scale cooperation to manage local irrigation systems, where Big Government would be be worse than useless (Lin Ostrom wrote much about this). For things like national defense we really need cooperation at the level of the whole polity, which requires chains of command. For global problems we need cooperation at the international level. To me “polycentric governance” is a flexible system that matches forms of organization to the nature of public goods that need to be produced, and the social scale on which they need to be produced. Totally agree, except that you’ve failed to see the spectacular success of Occupy. That is, important political changes are born from big changes in understanding and attitudes that come about when people are dissatisfied and groups or events articulate reasons for this dissatisfaction. That was the role of Occupy – not to directly create new political organization but to change the converstation. So here is Seattle, Kshama Sawant cut her teeth in the local Occupy movement and went on to lead a local socialist group to help pass our $15 minimum wage and then elect her to our city council. Likewise in 2014 I was finally able to lead the “Unitarian-Universalists for Economic Justice” to achieve the passage of 4 years study action issue on “Escaalting Inequality” for our UU denomination nationally, but only because Occupy had dramatically raised the awareness of this issue. Now Inequality is a widespread issue according to polls, and this is reflected in the rhetoric and proposals of many leading politicians. It’s a now big issue for the more principled Republicans too, not just Bernie Sanders. It seems to me that the Occupy movement was a failure. Its members camped out in a lot of city parks, but the movement pretty much dissipated after those members got kicked out of those parks. They did not even bother to find new gathering places. But one can credit it for getting such memes as the 99% vs. the 1% into the national conversation. The Occupy movement brings to my mind the theory of history cycles proposed by Arthurs Schlesinger I and II. They proposed that US history alternates between liberal and conservative phases, phases of reform and stagnation, of public purpose and private interest, of expanding democracy and containing it. 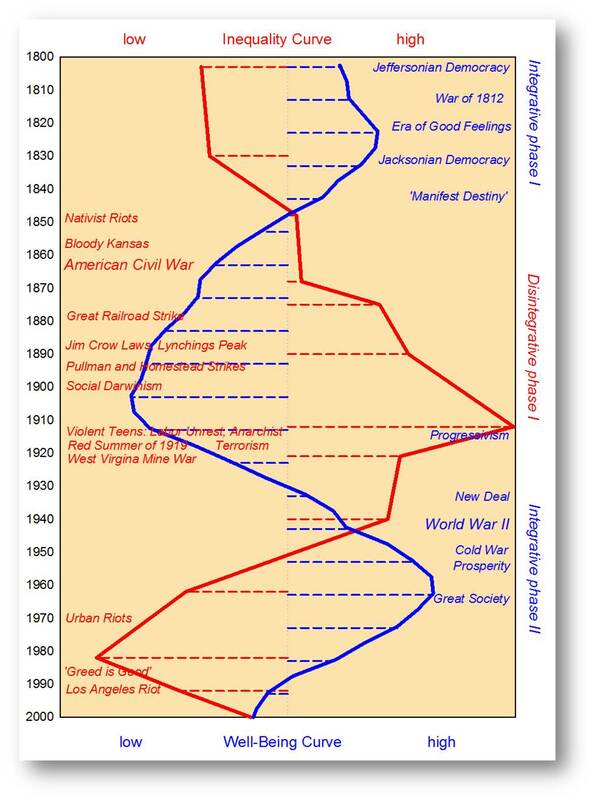 The phases are roughly 15 years in length, though the Gilded Age was a conservative phase that lasted over 30 years, and though we are currently in a second Gilded Age that has lasted even longer. Each kind of phase generates the other kind. Liberal phases end because it takes a lot of effort to sustain reform efforts, especially when those efforts seem to have succeeded. Conservative phases end because of the accumulation of social problems that society’s elites refuse to do anything about, problems whose existence they may not even accept. I remember thinking that the Clinton presidency might be the end of this Gilded Age, but it wasn’t. Bill Clinton wimped out and let the right wing set the agenda and vilify him as some left-wing ogre. Barack Obama’s presidency wasn’t the end of it either. He was too much like Bill Clinton and he was too willing to let the right wing obstruct his actions. The Occupy movement seemed to me like it would be the beginning of the end of this Gilded Age, but it was crushed all too easily. These things take time to build up. Occupy was just a warning shot across the bow. The big battle is yet to come. I expect the showdown in the 2020s, like Peter has predicted. The first Gilded Age followed a major upheaval in race relations, the Civil War, and the second one followed another one, the civil-rights movement and the Sixties era. But there is another aspect to this, one related to our host Peter Turchin’s cycles of well-being. The US reached a peak in the 1820’s, a trough in the 1890’s, another peak in the 1950’s, and it is now heading toward another trough. I’m not altogether certain why a New Humanist article should be a matter of scientific urgency. Personally I think anarchism is usually an unwholesome blend of stupidity and reaction but what do I know? At any rate, the caricature very often is the popular view. Attacking the caricature is confronting misconceptions. I suppose anarchists wouldn’t be able to distinguish varieties of statists very well, and tend to confuse (“conflate”) them in odd ways. As to state-like formations in American Indian societies, I really have to suggest examining the Natchez and the Iroquois League. There is a reason the Iroquois were an inspiration for Franklin. And I think the network of trails sharply modifies any picture of American Indians as little bands wandering a wasteland, occasionally meeting at random. (Like the rather foolish recent movie Hostiles.) The career of the great leader Tecumseh shows very clearly there were extensive multicultural influences more like international relations than we may have imagined.. The melungeons and the Mingo also suggest blending, even deliberate in the latter case. As to the general notion that human powers over nature enables which kinds of activities they can carry out, offers them new goals to aim for, poses new challenges, that seems obvious. The further idea that changes in the scale of those powers over nature revises everything, that such changes are not simply scaling up, like extrapolating a graph, that sufficiently large changes are more like entering a new realm of possibilities also seems obvious. And the assertion that nonetheless these powers over nature do not necessarily straitjacket society, that conscious intervention of the right kind can take us to a society where hierarchy is for tasks, not a way of life….is not so obvious, but I tend to agree in general. Unfortunately this all seems suspiciously like chatter about the productive forces, which is of course entirely unacceptable to all decent-thinking people. I’m a layman and I hope this comment isn’t an unproductive digression or a rehash of ground already covered. Something struck me when reading “human powers over nature” and that is Native Americans seemed to work with nature rather than against it. I’m thinking that a civilization that expends energy in working with nature would leave a less impactful historical record. This may mask their level of sophistication, ie the work they wrought is subtle but did take many years of experimentation. Now that I think of it, does Sechat take into account the astronomical knowledge and precision of the Chaco or Stonehenge? I believe Peter’s comments are virtually all completely correct, according to my own research. Thanks, Herb! Judging by how the comments polarize on Twitter, the dividing line is between the numerate and innumerate. What happened first: group organization or taxation? Group organization or government: without it you cannot administer a tax system. The first job of government is security. This is not a physical good people consume but it is the prerequisite for a successful society. Security, which protects a fair system of law, is what you pay the taxes for. It allows the people to predict the future better so they can organize. A bureaucratic ‘tax system’ is an extremely effective means of raising revenue to pay for the people’s plans – but, unfortunately, also the corrupt expenditure of the bureaucrats and elites, who can find many ways to siphon it off for themselves. Today it would be technically feasible to have a ‘Gofundme’ government where the finances were raised voluntarily project-by-project. The main obstacle to this form of decentralized government would be security and law. You still need to pay for the first function of government: a hierarchical authority to administer the laws of the game and protect the community of gofunders from external attack. Once in place though, the lower forms of hierarchical government, government services and such, could whither away and be replaced by gofundmes. I would expect people to be more generous with decentralized gofundmes they can hold accountable (stop funding) than with taxes to an inefficient centralized Bureaucracy for Public Goods. The main question is how to maintain security and stop the government which controls it from abusing its power and creating a support base by encroaching into the supply of the provision of public goods. “The Davids” don’t appear to be arguing that “states” (hierarchical authoritarian leadership, unique control of territory) existed before modern times, but that cooperation of many people over large distances can be achieved without such. OK it’s a stretch to call a “hut” monumental, but cf Burning Man and other modern festivals. Humans self-organize well. Humans self-organize well, no questions. But if you look into how modern festivals are organized, there is a dedicated crew behind the scenes that makes sure everything runs well. It doesn’t happen simply because several thousands people got together and spontaneously organized. Organization requires hard work. My point was that festivals like Burning Man are temporary in duration and limited in space. Recurring rather than permanently fixed. Those who carry the badges of authority at Black Rock are regular Joes the rest of the year. The people come and obtain whatever social goods, and everybody departs. Self-organization implies that useful leadership emerges spontaneously and workers support the organization voluntarily, with a sense of shared ownership; not anarchy! The architect directs the masons, but each mason carves their own gargoyle to taste. Not the same marching in uniform. The Mammoth hut is a residence which, for its time, is best compared to a spectacular palace than a monumental building. A monumental building is always more than a residence: with its image alone it must express a concept relating to group-identity. Buildings that are symbols of group identity get more impressive and complex towards current times and this can be measured in increased number of buildings and their physical characteristics. I wouldn’t necessarily say that the buildings themselves get more impressive over time – that is part value judgement and which also will depend on assessing the buildings were designed to do and how well they carried out that function for the polity that constructed it. A monumental building that is completed just before the polity collapses is not a very impressive one because it didn’t work. To say that Occupy accomplished nothing seems rather myopic. They put inequality on the agenda. To name just some US electoral repercussions, they provided a huge boost to Sanders, Warren, AOC, etc. What have ‘Sanders, Warren, AOC, etc.’ accomplished? Nothing. The constant war storying of the Occupy movement as if it was something important is ludicrous. While this debate has occurred Donald Trump has been busily reducing inequality by dismantling globalism – thanks to the much more important populist movement, the wave of support that made him the US President. People Who Must Not Be Named have had 1,000,000* more influence on America than the Occupy movement and have actually got results. OK, let’s not get too political on this blog! One thing I disagree with Graeber is that one cannot separate science from politics. Let’s focus on ideas. It’s important to understand that although the student-led ‘Occupy Movement’ may have made an impression on East Coast leftist professors, who name it and constantly tell stories about it, it was totally ineffectual and didn’t last very long, by comparison to the decentralized popular movements that have been measurably more politically impactful over the span of the last decade or more. I can name three that make the ‘Occupy Movement’ look like a minor pop concert in Central Park. I believe this actually began in the 1980s or 1990s and accelerated with the invention of Bitcoin in 2009 and the rise of Cryptocurrencies and alt-tech over the latter half of the last decade. This movement is political but it is not strictly considered left or right. On the left it appeals to anarchists, on the right libertarians, but there are also centrists who want to use the technology politically. Overall its effect so far has been politically decentralising. Why do so many people wear red MAGA hats? Donald Trump put a name to a pre-existing Americanism movement. This movement has directly challenged the globalism that has caused a lot of the inequality in the US. Jobs have returned to America under the Trump administration. Use of memes by Youtubers and Twitter accounts to express political ideas and alt-media channels which users subscribe to for their news editorials rather than legacy sources. Meme-specific movements such as Kek and Pepe have effectively satirised inequality of speech and provided a platform to criticism corrupt political actors. Pewdiepie is a movement unto himself (85 million subscribers) challenging power of big corporations. (T-series channel). Leftist professors suffer memes and don’t look at alt-media so don’t understand them so are completely oblivious to the success of this movement (don’t even understand it’s a movement) and so have ignored the resulting increase of censorship by legacy tech, their direct competitors. Well. I think there are a lot of attempts to return to a more familiar social concept by group formation. By trial and error. Obviously the internet offers a new and easy access opportunity for that/ but old and new concepts are overlapping each other, in a way you should be carefull attributing succes and failure parallel to the box they are in. Occupy for instance as a mental consciousness movement stretches to the too big to fail concept/ in relation to civilians having to pay for the damage, which still lives on in the political debate about states having to pay for other states debt, as it plays out in Europe and is also related to the US China trade ratio. Although it does not call itself the same movement anymore, it’s the same sensation. On the other hand cryptocurrency, how ever big it might suggest to be is nothing more similar too the nerdish experiment concerning avatars at the time, which never landed. Because it confuses a general software concept: blockchain, with being a currency, as it functions in the economy between supply and demand with a relative secured value. It is not a currency, but a trading technique. I guess it got into play because of the parallel beteeen local currencies already used at places/ and technicians living in these places, when the financial crisis happened. The ponzy scheme speculation on bitcoin in the Chinese stockmarket after that, which drew a lot of speculators in a dead market was confused with a real value. But I do believe internet groups in comparison to the old concept of people gathering in a smelly room with some color and seat formation for an exchange of ideas is bound to supersede that. What makes someone a “globalist”? Doing business deals in distant countries, like Donald Trump? “Globalists” as great villains seems like a conspiracy theory. It seems to me that Donald Trump is very unqualified for the Presidency, and IMO it is a testament to how far the United States is in a structural-demographic disintegrative phase. One might expect Republicans to choose someone like Mitt Romney or Jeb Bush, but they chose him instead. On the Democratic side, it seemed in 2016 that Hillary Clinton would get essentially no opposition, but Bernie Sanders put up an impressive fight. Most recently, Alexandria Ocasio-Cortez unseated a long-time Democrat, and some Democratic politicians were annoyed because they were “waiting in line”. As to the Occupy movement, Bernie Sanders, Elizabeth Warren, and AOC not doing very much, they have not had much opportunity to. But that may be changing. If nothing else, AOC is distinguishing herself as a Congressional quizmistress. The Occupy movement introduced the 99% vs. the 1%, and recently, we’ve seen such proposals as “Medicare for All”, student-loan forgiveness, free tuition, and a “Green New Deal”. AOC herself has asked why there always seems to be money for “unlimited war”, but not for stuff like that. Massive movements you are ignoring have answered these questions. You need to read up about international governance. When political leaders sign treaties agreeing to plans – often drawn up by unelected bodies like civil services, supra-state institutions and NGOs – that require the state to give up its power for a greater cause, making the plans impossible for subsequent generations of the citizens of each state to reverse, even though it can have have sweeping and catastrophic impacts on economies, cultures and the health of humanity, that is globalism. Graeber comes across like a modern day SJ Gould, with the rhetorical tendency to straw man the current consensus in order to step in as the savior with a revolutionary new theory. Boehm has addressed the issue of forager egalitarianism at length in his various writings on the topic. In brief, foragers tended to be nomadic, and nomadic foragers tended to have few possessions, be familiar with the use of hunting weapons, to live in fairly small bands, and to have the ability to walk out on inegalitarian social norms. Thus, there was a strong dynamic attractor within foragers for low “wealth” inequality and low levels of inegalitarianism (unfair rules). However, as Turchin notes, not all foragers were nomadic or lived in small bands with revolving membership. Some areas, such as the Pacific NW, had large, stable communities with marked levels of inequality of wealth and privilege. This is not some ground breaking premise. It would be more accurate to describe it via attractors or dynamics. Foragers did tend to live egalitarian lives (though they differed vastly in prestige and influence), but once conditions changed, strong men were able to assume control. One such condition was agriculture (which negated easily walking away from strong men), but reasonable archeopoogists don’t think it was the only condition. Global inequality is dropping at a historically unprecedented rate as global living standards and quality of life are improving at an even faster rate. But, Graeber’s narrative on history seems exaggerated for effect. This is a good point — they never acknowledge Boehm. I should have brought it up. As to global inequality falling, it’s of little solace to the large population strata in the US, whose well-being is declining in absolute terms. Global inequality is falling only between nations, while growing within many nations, not just the US. Absolute living standards are higher in the US now than at any point in history, and they are higher in the US than any other major diverse nation (see Average Individual Consumption comparisons). We’ve already had this debate and I find your modern “immiseration” narrative to be absurd. I write about income growth and living standards and you are compelled to reflexively link to a totally separate topic on income inequality. The fact that so many on this web site confuse the two just reinforces the futility of having a rational debate on living standards in this forum. On this topic, I broadly agree with Turchin. Let’s leave it at that. That you deliberately ignore this key fact continually just reinforces the futility of having a rational debate with you. Hi all, we’ve had this conversation before, as Swami pointed out. Let’s agree to disagree. Look at the stories of all the industries that Millennials are supposedly killing. That’s from them not having enough money to spend on those industries’ products and services. The essence of the book is that activities that are hard to decompose into quasi-independent sub-activities do not respond well to increased manpower. So, adding people to a late project tends to make the project even later, and so on. If one woman can produce a baby in 9 months, that doesn’t mean 9 women can do it in one month. Not sure what this has to do with the current question though. It might relate though to Joseph Tainter’s theory that increased organizational complexity leads to societal disintegration. I think it relates because it can possibly provide an explanation of why society is stratified, because it is functional. It would be a matter of evolution rather than design, there are several possible configurations of a society, but only some would be “successful” and therefore continue to exist, the failed configurations die off. There are a lot of patterns like this in nature. I was taught in middle school (it was a Soviet school so this was presented as part of scientific Marxism; not sure where it really comes from) that low production capacity in pre-agricultural societies limited the potential for inequality. A man simply did’t produce enough surplus to allow the ruler too much glitz (even though rulers with despotic tendencies have existed much longer than humans as a species, as they have been documented in baboons, for example). 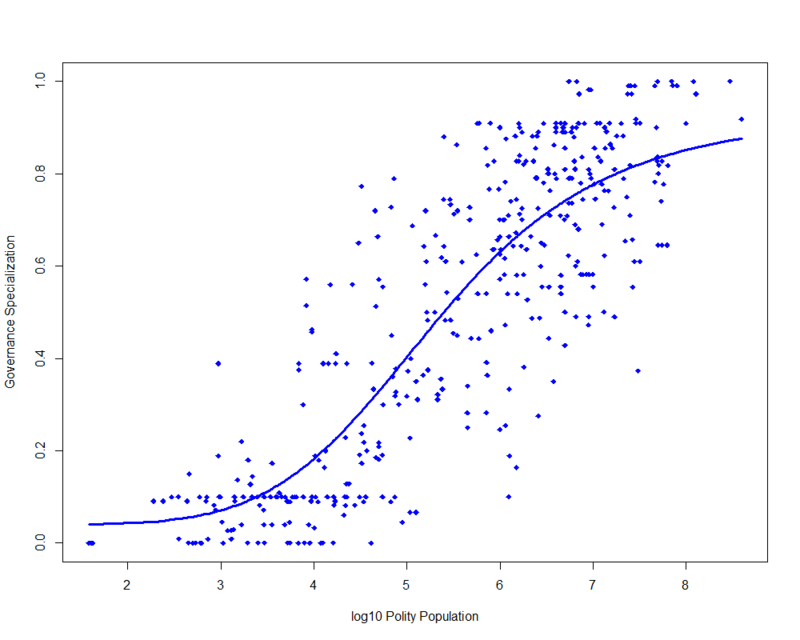 Similarly, the potential for societal complexity was limited by low population densities. I always thought this was obvious? That said, I suspect the complexity of Eurasian Neolithic is seriously underestimated. In Okinawa where I live there are huge dolmens that look like they’ve been airlifted from the British Isles, and I’ve seen their exact copies in India and the Caucasus. Their roofs are stone slabs weighing many tons. Who built them? Why do they look so similar everywhere? I suspect the differences between advanced Neolithic societies and entry-level Paleolithic ones were as profound as those between us and the Neolithic people; it’s just difficult for us to understand them because to us the Stone Age people all look like savages. But for a Stone Age hunter all agriculture-based societies, from Ancient Egypt to modern Japan, would probably also look much the same. Also, why is it always about agriculture? Animal husbandry predates agriculture, can be difficult to recognize in archaeological context, and can have the same effect. Mongols didn’t have agriculture, but their society was complex enough to kick everybody’s economic base. I’ve never heard of that one before. There is only one animal that was domesticated before the invention of agriculture, and that is the dog. The first domestic dogs likely lived in a semi-feral “stray dog” sort of state, like village dogs and pariah dogs. The dingo of Australia is a feral dog. There is an exception, the Salish wool dogs. They were bred for long hair that would be sheared and made into threads for weaving into cloth, much like wool sheep. That happened because Pacific Northwest salmon could sustain large non-agricultural human communities. All others were domesticated after the invention of agriculture, with goats, pigs, sheep, and bovines being domesticated in the Fertile Crescent not long after the domestication of wheat there. There are plenty of cultures that have animal husbandry but no agriculture; the reverse situation is pretty much non-existent. Reindeer were domesticated at least 3,000 year ago in places that didn’t have agriculture until very recently or still don’t have it. Domesticated horses were present in Kazakhstan more than 5,000 years ago; agriculture appeared there in the 20th century. Cattle, goats and sheep were domesticated in the Near East at least 10,000 years ago. Agriculture was still very local at that time. You are well informed. However domesticated animals do not provide in daily food. It’s not the company it is about, nor the fact you could organise it as a culture. Agricultural societies get a large free time space in return, so it gives them the opportunity to build huge structures. They do not spend their time herding. That’s why agricultural societies reached a higher hierarchy (evolutionary stage) than nomads. Whether building these structures again was not very efficient, being based on superstition is another question. That’s a common misconception. Numerous studies of hunter-gatherer societies have consistently found that hunter-gatherers have more free time than agriculturalists. However, hunter-gatherers can’t increase their productivity even if they spend more time working, because natural resources are limited. Agriculturalists, on the other hand, can be forced to produce more than they need by working more land, and that makes them vulnerable to exploitation. My reading of Scheidel is that Scheidel clearly acknowledges social revolution can equalize society.. But although Scheidel is not so crass as to rave, Scheidel I think rejects social revolution under any circumstances, even if the stasis of a calcified ruling class slowly grinds society into an ecological collapse or into a dark age of depopulation and deculturation. Re the monumentality of mammoth bone huts, I would have thought they weren’t monumental at all. Buildings made of timber imported into the tundra lands would be monumental. 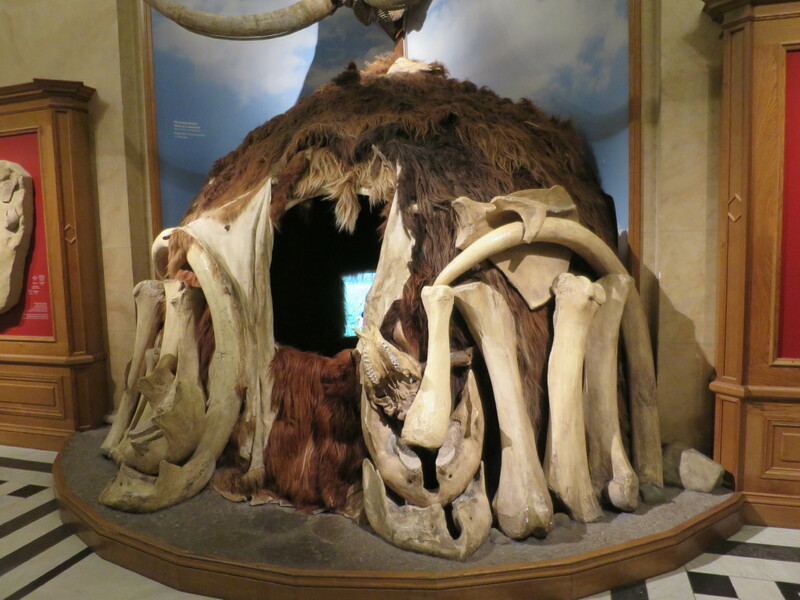 Mammoth bone huts were made from scrap salvage, no? And as to American Indian states, I suppose you can imagine a stateless society built the city at Cahokia. But I’m not imaginative enough to do that. Cahokia was probably not a state, but it was a centralized society (a complex chiefdom), and apparently quite despotic. God-chiefs, human sacrifice. If the Cahokia complex chiefdom had been closer to another despotic centralized society, would the resulting “need” for organized warfare have made it indistinguishable from the typical state? States defend property of some sort (not necessarily individual property!) most of all against other states. Doesn’t the organizational needs of such warfare impose a uniformity in state structures *not* to be expected in the early forms of the state that emerge without such competition? (A “pristine” state, I think the term is.) It’s not clear to me how the Mongols, with their Golden Family, are so different from a complex chiefdom. Regardless of Cahokia’s status, Graeber and Wengrow neglect to examine the issue of organization/control of warfare as a marker of statehood. By that, the Plains Indians are not the ones who have much claim even to a transitional form of state. So this is sort of OT about the critique of Graeber and Wengrow. Another major author who is conspicuously absent from this discussion is James Scott. In his last book, Against the Grain, he summarises the empirical evidence in a way that may constitute a middle way between Turchin and G&W. Crudely, he argues that sedentism predates agriculture but significant inequality requires states (and in some cases states forced agriculture onto relatively affluent sedentary foragers). Also good point. I recently finished Against the Grain, and am planning to blog about it eventually, but probably not any time soon. Samuel Bowles, Eric Alden Smith and Monique B. Mulder (2010). “The Emergence and Persistence of Inequality in Premodern Societies: Introduction to the Special Section.” 51(1): 7-17. Actually the frase anarchist is misused because it originally means expressing your political preferences in a material way by acting them out, which leads to sabotage, assault, striking or in mild form demonstrating. It also does not mean being anti a hierarchy structure as such/ but opposing against it when the wrong one is instituted. During the French revolution as well as the Russian anarchy was used to get to the next hierachy. In a secundary meaning it is also understood as valuing individual ideals higher than the official bureaucracy, because it represents a dead system. It does not mean improper selfishness, but perhaps refers to the state of innosence mentioned by Rouseau. I believe human society is evolving and therefore gets more complex in its hierarchy over time/ but at the same time it evolves through hierarchy system types, where at some point the previous hierarchy has to be abandoned. This happened during the transition from monarchy to democracy, from a latin clergy to the reformation leading to democratizing religion through the invention of the printing press, but just as well from farming jobs to industrial ones early previous century. So all of these transitions could be associated with a teturn to innosence, meaning an emerging self awareness. This does not mean returning to chaos, as an early king or latin clergy would have called it at the time, to protect his hierarchy by declassifying the alternative. In that box the reference to populism contemporary politicians use to defend their hierarchy very often looks very parallel to this. To subject the argument to seek for proof in the assent of human culture which would establish early cultures were innocent and could still build huge structures seems a far cry from what it’s all about. But I guess the general notion such a transition is about to happen again or is necessary is in general a correct instinct. Prefering the old hunter gatherer society, which was far less alienated than ours, stands out as a current trend amongst scientists as well as younger people. So, I guess it’s not a coincidence. Turchin Peter, Harvey Whitehouse, Andrey Korotayev, Pieter Francois, Daniel Hoyer, Peter Peregrine, Gary Feinman, Charles Spencer, Nikolay Kradin, Thomas E. Currie. 2018. “Evolutionary Pathways to Statehood: Old Theories and New Data.” SocArXiv Preprint. States evolved naturally from behavior and underlying circumstances. Agriculture demanded military protection of the land and was also involved in acting out the difference between superior and inferior cultures, resulting in slavery. Because agriculture involved a money system used for administering ownership of foodstock, it became the major way to determine behavior, by directing it based on agreed rights. Upstream to the military leader/ downstream to the needy. The Romans made a big difference by choosing metal for coins and no longer relating it to food stock, the Egyptians were still doing, but to a metal mine. The first central bank. Only when it became involved in trade again around the renaissance, it evolved into a debt system and private banks like De Medici. This was a very different administration concept of bureaucracy. Introducing so called legal debt time and ownership. This still is the only recognized ‘legal’ system states use for central administration/ although in the mean while debt can only be controled by central banks, because global economies have become to imparallel, so we are back in Roman times with digital mines this time which cannot deplete. Although there is a lot of confusion about which system is real. It has become a double standard system. So, therefore there is no such thing as a single concept of what bureaucracy is. It depends on which values it is based on, as they are perceived and how it distributes them. Although the upstream downstream concept still is the central function, next to horizontal trade in supply and demand involved in a perceived debt time. Almost all wars and revolutions are related to the money system and its perceived debt rights, related to ownership. Since agriculture takes only 5%’of jobs in society, these numerous tests must all be false. I am not sure if the explanation of the so called exploitation of this 5% group would represent the interest of 95% of the population correctly. I guess not. It takes 5% of jobs today, but in early agricultural societies it was over 95%. Even in more advanced ones such as the Inca Empire almost everybody was a peasant. Inca Army couldn’t lay prolonged sieges because after just a few weeks the soldiers had to return home to tend to their fields.